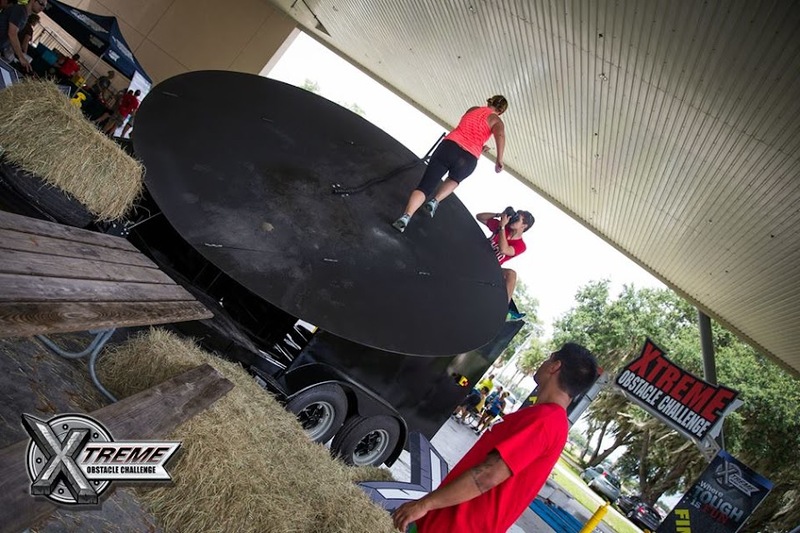 Though the grounds of the Fun ‘N Sun made a perfect backdrop for an endurance run, the Xtreme Obstacle Challenge served up a lot of sun and less fun. It also lived up to its name by offering an endurance race that was extremely disappointing. Thankfully, I shared the experience with my good friends, Chrissy, Faith and Greg because if I ran it alone, I would have been even more miserable. I’ve had my share of mud runs, but by no means, am I an endurance run expert. However, I do have a certain level of obstacle expectations and fanfare which has made me an endurance run snob Having been part of numerous races from limited-budget small town races to over the top franchise races, I have a certain level of satisfactory service expected for any race. The chaos of the pre-registration packet pick-up set the tone of the race which lacked the usual party atmosphere at most endurance races. The scene lacked upbeat music and high energy to pump the participants’ energy levels up. Instead a terrible garage band blared bad renditions of classic rock tunes. Since there was no bag-check, we grabbed our bibs and returned back to the car to drop off our race shirts and other belongings. With over an hour to kill, we gladly welcomed the tedious task to waste time before our 8:30 wave. 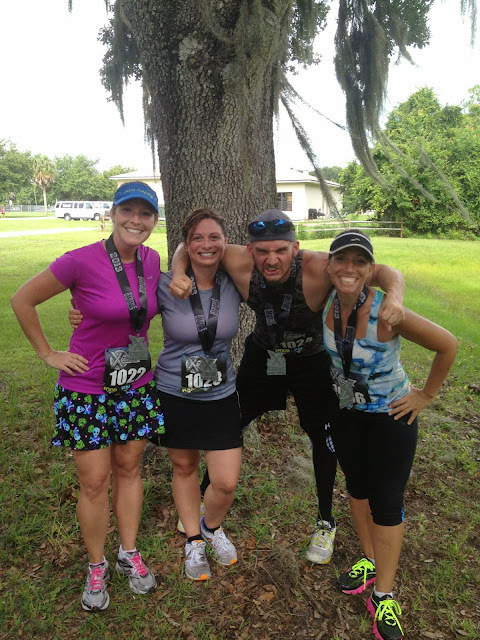 We took the time to stage some finish line photos and studied the map to learn the obstacles. Around 8:00 we headed to the start, but we still had to wait for the Xtreme Challenge Competitor wave to start. 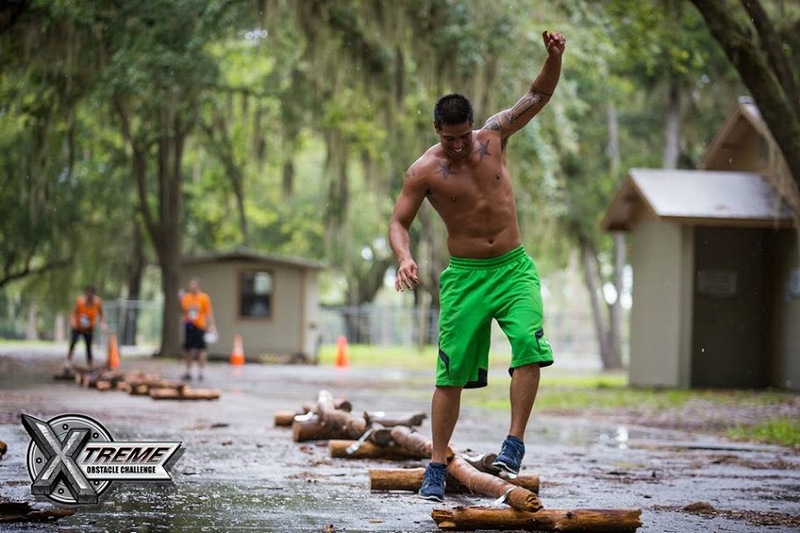 Once the race was underway, the competitors scaled the first obstacle two at a time, a rope climb with a fireman pole to slide down on the other side. With participants taking on the first obstacle in pairs, there was quite a delay between waves and we waited an additional 45 minutes for our new wave start time at 9:15. In other words, we waited 45 minutes without water in the hot sun as mosquito snacks. Again thankfully, two gentlemen, Matt and James entertained us and helped keep smiles our faces with their wit and charm. Our small team of four grew to a team of six while we waited those long 45 minutes. The crowd heckled and yelled to speed things along and the angry mob helped shorten the time between pairs. Teams were frustrated with the delays as they couldn’t start at the same time as their teammates. Chrissy and I led our team. I wasn’t quite sure of the best strategy to take on scaling the rope wall, so I took a running start and grabbed the rope. Feeling a bit like a superhero minus the superpowers, I pulled myself upward. Once at the top, Chrissy and I hollered for Faith and Greg to start. Then, we turned to descend down the fireman pole, but the distance and height panicked me a bit. I closed my eyes, stepped off the platform and wrapped my legs around the pole to slide down. I landed lopsided in a haystack, but I landed safely and Chrissy and I darted out the way to wait for Greg and Faith. 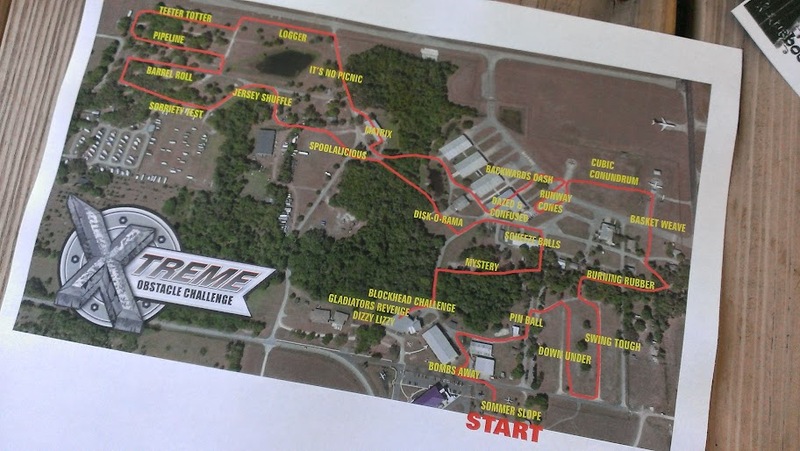 For our next obstacle, we run under jet planes and headed to an open field for our next obstacle, the Down Under. Once we crawled through, a water station waited on the side and I gulped down several cup of water to quench my 45 minute extended dehydration. After swallowing down gallons of water, we set off for our next obstacle, Swing Tough. I faked my way through the swings only to be faced with thousands of tractor tires and then an equal number of picnic benches. Though the It’s No Picnic benches told us to go “over and under”, I climbed over all of them and my legs screamed from all the climbing. For the next obstacle, we climbed stacks of pallets to scale a wall. Then, we carried a safety cone and ran with it, dropped it and ran backwards into an airplane hangar with a labyrinth made with police line barricades. After climbing over more “Over Under” picnic benches and crawling through large dark water pipes, we entered another dark airplane hangar for The Matrix, an endurance run rave party with glowing black lights and hard to see tangled ropes. An obstacle that definitely required team effort, Greg lifted ropes out of our way, so we could navigate our way through. The darkness didn’t help at all. For a majority of the obstacles, it appeared as though the race organizers gathered items laying around the Fun ‘N Sun grounds. With dodgy, shaky bolted pine logs hinged together serving as balance beams, I found myself passing on quite a few of the obstacles when I normally take on all of them at mud runs. I preferred the sturdy obstacles like hurdles barricades. Even The Logger felt sturdier than sadly strapped together pine logs. In the hot blazing summer sun hurdling over barrel rolls, more barricades and picnic tables, I lost my steam. I honestly preferred running past the obstacles. They were no longer fun and I we just wanted to be finished. Thankfully, Matt and James weren’t too far behind us and kept us smiling by heckling about us cheating cheering for us. 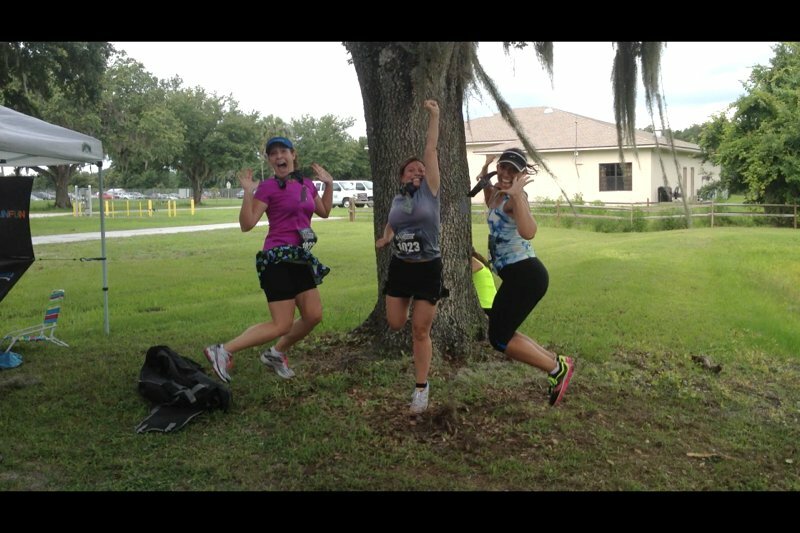 Turning our frowns upside down was truly the test of strength out there in that hot Florida sun. As we approached the finish line, we faced three final tasks. We had to solve a Cubic Conundrum, a wooden block puzzle to match a photo. I quickly solved it (Or think I did. Chrissy says otherwise.) and ran towards two large Gladiators. As they pushed me back, one kneed me in my knee to feel the full force of the Gladiator’s Revenge. With foal language intended for a mature audience, I shoved him back with all my force and hobbled off to the finish line. But first I would have to scale the Dizzy Lizzy that was lifeless and not moving, much like how I felt. I ran up, grabbed the rope to climb up and over. No more obstacles! I only needed to cross the finish line to grab my medal and a beer. 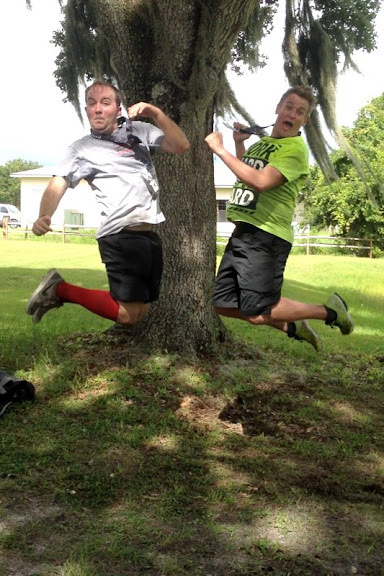 However, it required one small Anchorman style jump, an art form that Matt and James taught us. Apparently, no endurance race is complete without one. 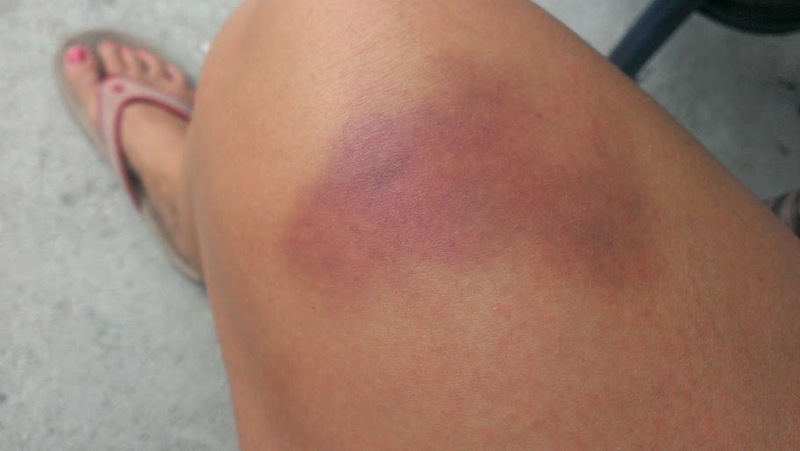 To be fair, the gladiator that bruised me did apologize to me after the race. 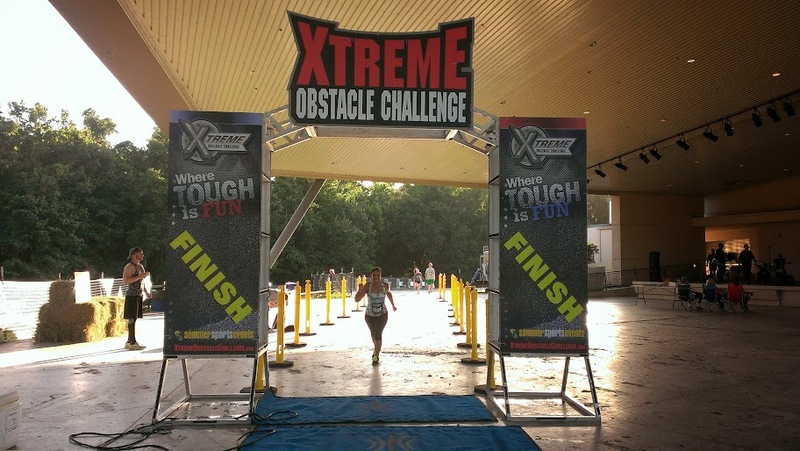 I still would never participate in the Xtreme Obstacle Challenge again. 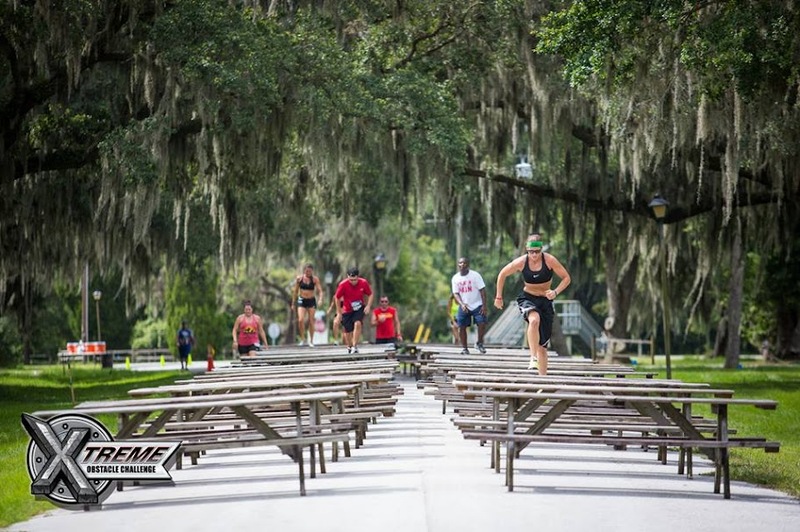 This entry was posted in fitness, review, running, sports and tagged endurance run, fitness, Florida, friends, Lakeland, miscellaneous, musings, photographs, race, recap, review, Run DMT, running, sports, thoughts, Xtreme Obstacle Challenge. 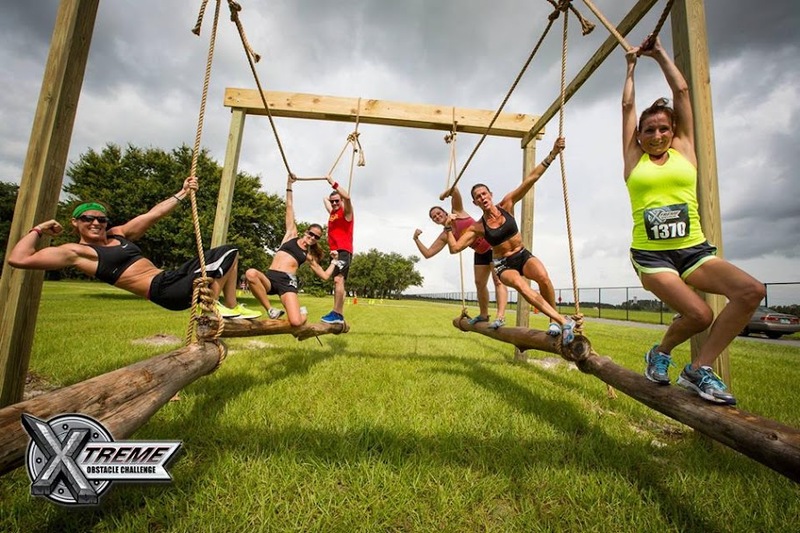 We started around 11 a.m. and the heat added to the degree of difficulty, but since most obstacle races take place mid-day, that was appropriate. It was typical of a lot of workouts I’ve done during the last six months, a few of which I’ve chronicled on ABC Action News here in the Tampa Bay area. For most of the obstacle races and mud runs I’ve done, I usually opt for the earliest wave as I did with this one to avoid the heat. Also, most obstacle runs start on-time. I’ve had my share of 5Ks in the summer heat and I think I can handle pushing myself in the heat. Waiting 45 minutes past our start time without water or any means to hydrate ourselves is unacceptable and highly dangerous.